I’m not very adventurous when it comes to trends. I’m pretty happy the way I am, but Kim keeps teasing me about how she yawns everytime I enter the office. 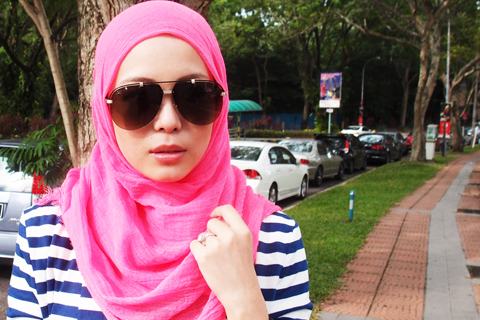 So one day, Kim dared me to wear a neon headscarf. Girllllll…. I got swag, don’t you worry, G.
You might not be able to see the maximum neon-ness in these pictures, but trust me, if you were one of those cars passing by, you’d need sunnies. When I came to the office, everyone laughed at me and was like whoaa my eyes and kept calling me a highlighter. Haha well, they don’t got no swag. 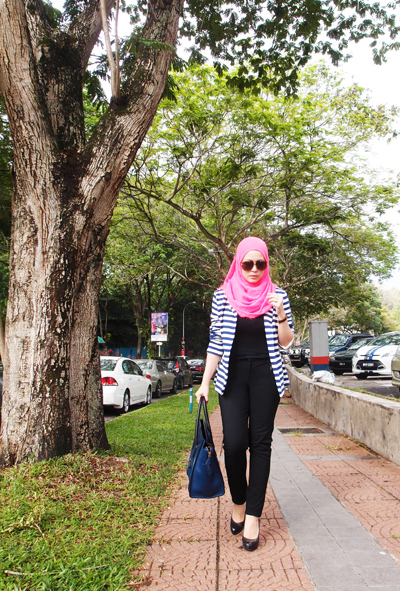 Wearing a neon pink headscarf from Tudung Sisters, striped blazer from Caron Boutique, pants from Skelly in The Closet, heels from French Connection. Check out the pants in many many many colours and shapes here. They’re RM 89 each. Like seriously. Btw, I love the color. Playful and funky. Vivy!…What size are you as I know you are petite. Was interested in the Skelly striped pants but am scared it’d be too big for me…. Salam sis Vivy.It’s so nice to see u wearing the hijab.but anyhow, it could be nicer if you change your dp of your blog, i mean the pic u r not wearing hijab. it’s just my point of view 🙂 Jazakillah. hi vivy, i’m one of the regulars here, i must say i’m pretty shocked to see you in headscarf. i mean, no offence to anyone…seeing some of your prev posting about your gonna wear hc someday makes me wonder when will you be doing it. (just curious) i wasn’t expecting it to be so soon (am still shocked)…religion aside i think you are pretty brave, cuz by doin so you might need to forgo certain types of dressing…which will not be easy, considering what a vainpot you are. once again no offence to anyone, please don’t do anything to the extreme, if you know what i mean. Could you pls pls pls share with us your skincare routine . Your skin looks amazing. Been reading your blog since 2009 and i remember old posts of yours talking about how you had problems with spots on the forehead and breakouts and what not but it seems theyve all dissapeared. Do share !! Thank youuu. I agree with Josephine. i’m really shocked that u decided to wear a headscaft. Ur ootd doesnt look attractive anymore. sigh. No offence but I dun understand how a modern young lady like you would make such a huge decision like this. Things will never be the same anymore. i think most of your non muslim readers are very sad. vy, the pants are out of stock in the colors that i wanted. can you please please restock it in beige? i mean in the size that i wanted. restock, pretty please? Can i just say that your ‘no offence’ doesn’t work because you’re actually being disrespectful towards Vivys religion which is Islam and comes with certain obligations with regards to appearance etc. If youre going to judge her based on her OOTD then find some other fashion bloggers. It’s really not nice for other readers to read comments like this that ‘non muslims’ will be sad. Where is your sense of respect for other peoples culture and personal decision? If you cant appreciate her covering up then that’s just a reflection of how shallow you are.